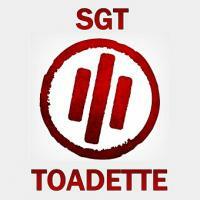 SgtToadette had the most liked content! Sounds like gun shop BS to me. I've always felt very meh towards the 92, largely because of the frame mounted safety. This is very interesting and has loads of awesome features. I'll keep my eye on on this. I also suspect a hit. I think we had 20 yesterday, which is pretty typical. Agreed. For anyone not convinced, however, I would be more than willing to aid with the surrender of any Benchmade products. I will make sure they're properly disposed of. Are able to take a photo? Let's not forget that Eugene Stoner also designed the AR-18, a short stroke piston rifle, after designing the AR-15. I think we often get caught up in a team mentality when talking about these things, but the reality is that both are different means to accomplish the same task. I'm not on team piston or team DI. I'm on team quality and if someone is in the market for a <$1000 AR, they should give this rifle some consideration. I've had good experience with my PWS and find it a pleasure to shoot. If you want to try one of their piston guns let me know. I'm pretty close to TTC. Different strokes for different folks, no pun intended. I own both piston and DI. Both run fine. PWS makes a good rifle, piston, DI, or otherwise. The determining factor seems to be manufacturing quality more than operating system. There are piss poor DI and Piston ARs. There are also great DI and Piston ARs. You get what you pay for. Most people won't shoot their rifles enough to know regardless. I hate you... That's a freaking steal. Overwhelmed.... AR Build with acquiring Tools, etc. I like the PWS ratcheting castle nut. Easy to install, won't back out, and easy to remove if needed. Thanks for the link. Looks like they updated the page. I like this configuration the most of any 320 on the market right now. I'd probably ditch the VTAC sights, but otherwise I don't know what else I'd do to it besides add a rds. Anybody have any info on this thing? Sig just announced a revamped VTAC P320 at SHOT Show. It removes the slide "speed holes" seen on the prior generation and offers an optic cut which doesn't remove the rear sight. Both are huge pluses in my book, especially as I consider getting into Optic devisions. Oh and I think it looks pretty cool, too. Problem is I can't find any damn info on this thing besides an article or two and a video from Larry Vickers. No SKU. No mention on Sig's website as of this post. I don't even know MRSP, but I'd be surprised if it was drastically different than the last gen. Thanks.